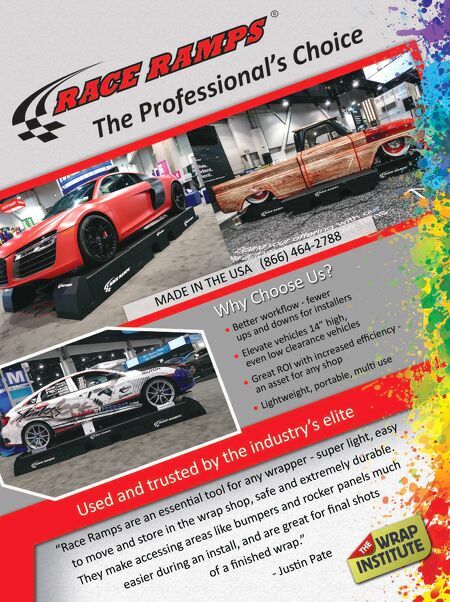 18 • WRAPS • 2 0 1 8 WRAP SHOP PRIMER BUSINESS & SALES THE ESSENTIAL EQUIPMENT FOR A WRAP SHOP Wraps with graphic elements require additional skills for installation and three basic pieces of equipment. First are the printers, such as solvent and eco-solvent printers that offer a high range of colors and latex printers that allow for immediate printing and laminating, Jen says. "It's all about preference," she says. Sumner recommends a wide-format, 60-inch printer for better printing on the wrap panels, since wraps cannot be installed in a solid piece. The printer prints the graphic images onto the panels, and the wide format keeps the panels seamless, he says. "When you print a graphic, you're limited to the width of material. You need to panel it and line it up like a puzzle," Steve says. The wide format also is ideal for laminators, which laminate the wrap panels and protect and increase the longevity of the graphic images, Sumner says. "The lamination is the nal step in the proper production of graphics," he says. Left: Tucked in a corner of Visual Hori- zons is a rotary engraver, laser engraver (with ventilation to outside) and stor- age shelves for engraving-related items. Above: They have two desk cubicles set up in the center of the production space. 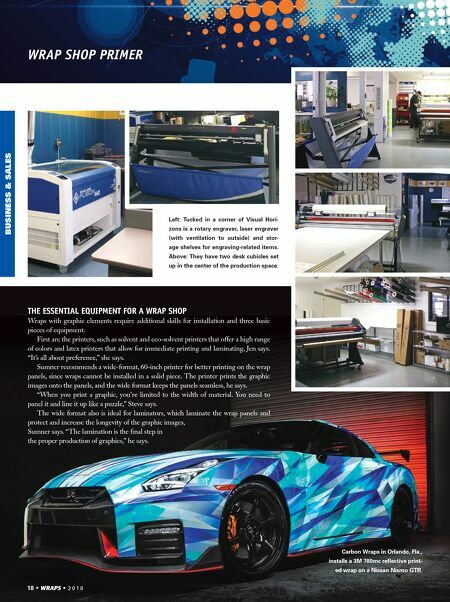 Carbon Wraps in Orlando, Fla., installs a 3M 780mc reflective print- ed wrap on a Nissan Nismo GTR.